Species In Genus: 1 sp. Etymology: (Greek: resembling Callitris) Note: Callitropsis Oerst. probably will not be available for use in plant names after 2012, when Xanthocyparis or another genus name probably will be needed for Callitropsis nootkatensis; all other California taxa formerly in Callitropsis (and before that, in TJM (1993), in Cupressus) are here included in Hesperocyparis Bartel & R.A. Price. Unabridged Note: The genus name Xanthocyparis Farjon & Hiep has been proposed for conservation against Callitropsis Oerst. by a vote of the Nomenclature Committee for Vascular Plants (Brummitt 2007 Taxon 56: 1290--1291), and if the vote is ratified at the next Botanical Congress in Melbourne in 2012, either Xanthocyparis or another genus name would be needed for Callitropsis nootkatensis; all other California taxa formerly in Callitropsis (and before that, in TJM (1993), in Cupressus) have been transferred to the new genus Hesperocyparis Bartel & R.A. Price and it is in that genus that these taxa are to be treated in TJM2. Habit: Tree 20--30 m, pyramidal in youth. Stem: ultimate 3 orders of shoots in 2-dimensional, pendent clusters; bark fibrous, fissured, peeling, orange-red to gray-brown to purple-brown; ultimate branches 1.1--1.8 mm diam, +- 4-sided to flat. Leaf: opposite, 4-ranked, of 2 kinds, both scale-like, closely appressed, overlapping, green, not glaucous; glands generally obscure; lateral leaf tips generally parallel to axis of attachment or diverging. Pollen Cone: terminal, 2.4--4 mm, 1.3--2.6 mm diam, generally yellow. 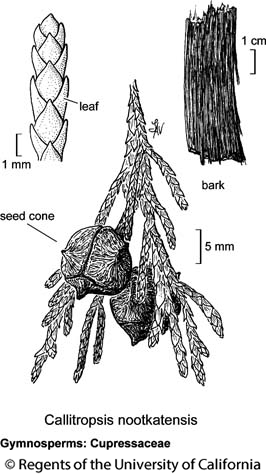 Seed Cone: 6--12 mm, spheric, ash-gray; scales generally 4--6; maturing 2nd year, opening, falling at maturity. Seed: < 15 per cone, 3--4.6 mm, brown to red-brown, not glaucous, flat, wings generally 2, vestigial, attachment inconspicuous; cotyledons 2. Ecology: Cool, moist, forested, well-drained mountain slopes; Elevation: 20--2500 m. Bioregional Distribution: KR (Del Norte, Siskiyou cos.); Distribution Outside California: to Alaska. Synonyms: Callitropsis nootkatensis (D. Don) Oerst. ex Florin, nom. inval. ; Callitropsis nootkatensis (D. Don) Oerst., nom. inval. ; Chamaecyparis nootkatensis (D. Don) Spach; Cupressus nootkatensis D. Don; Xanthocyparis nootkatensis (D. Don) Farjon & D.K. Harder, superfl. Citation for this treatment: Jim A. Bartel 2012, Callitropsis nootkatensis, in Jepson Flora Project (eds.) Jepson eFlora, http://ucjeps.berkeley.edu/eflora/eflora_display.php?tid=82092, accessed on April 20, 2019. KR (Del Norte, Siskiyou cos.); Markers link to CCH specimen records. Yellow markers indicate records that may provide evidence for eFlora range revision or may have georeferencing or identification issues. Purple markers indicate specimens collected from a garden, greenhouse, or other non-wild location.